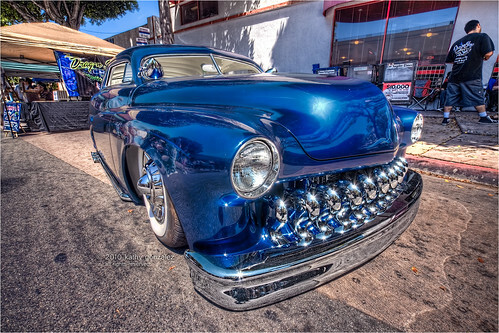 this merc custom, also from the whittier uptown show, is seemingly the companion piece to this one. this was the second of three similar vehicles parked on this corner. maybe it was just a coinkydink that they were clustered in the same area. i don't think i bothered with the other, as i remember it was just painted in primer gray and not too dazzling or remarkable. i remember this being a spectacular, deep blue, but i think maybe i've made it too dark here. the time of day made for an uncontrasty, flat shot, so i had to jack it up a bit. but that's the point of my tweaking, now isn't it?